This page is about the flag of the historic state. 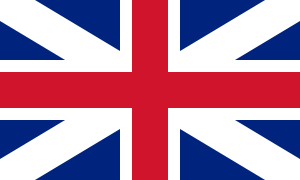 For the flag of the modern country, see Flag of the United Kingdom. The flag of Great Britain, commonly known as the Union Jack or Union Flag, is a maritime flag of Great Britain that was used from 1606 to 1801. The design was ordered by King James VI and I to be used on ships on the high seas, and it subsequently came into use as a national flag following the Treaty of Union and Acts of Union 1707, gaining a regularized status as "the Ensign armorial of the Kingdom of Great Britain", the newly created state. It was later adopted by land forces, although the blue field used on land-based versions more closely resembled that of the blue of the flag of Scotland. The flag consists of the red cross of Saint George, patron saint of England, superimposed on the Saltire of Saint Andrew, patron saint of Scotland. Its correct proportions are 3:5. The flag's official use came to an end in 1801 with the creation of the United Kingdom of Great Britain and Ireland. At that time Saint Patrick's Flag was added to the flag of Great Britain to create the present-day Union Flag. King James had the habit of referring to a "Kingdom of Great Britain", considering that it had been created by the Union of the Crowns. However, despite the personal union which he represented, in practice England and Scotland continued as separate kingdoms, each with its own parliament and laws, for another century. The Kingdom of Great Britain finally came into being in 1707. "Scots union flag as said to be used by the Scots." The flag of the new Kingdom was formally chosen on 17 April 1707, two weeks before the Acts of Union of 1707 were to take effect. Sir Henry St George, Garter Principal King of Arms, had presented several possible designs to Queen Anne and the Privy council. The principal alternative for consideration was a version of the flag with the Cross of Saint Andrew lying on top of that of Saint George, called the "Scots union flag as said to be used by the Scots", but this was rejected. Flag of Great Britain Facts for Kids. Kiddle Encyclopedia.